I'm getting a bit of a late start with my February pen pal listing--my apologies! Would you like to have a new pen pal . . . for a month? I hope so! Simple and fun and a great way to find a new pen pal. I loved last month, can't wait to start this month! 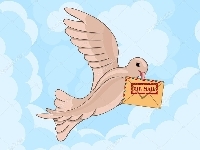 Do we mail everything at once or wait for a reply and then send the next item on the list? You will mail each week. I'll put the dates in.